Every show followed the same formula. They traveled on the road to play a team that cheated and beat them for the first half of the game. 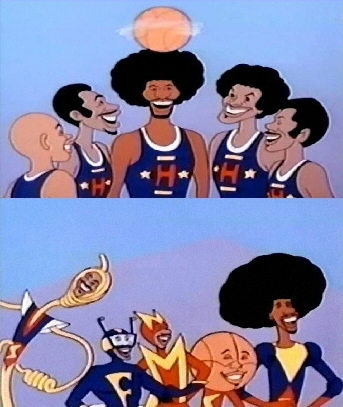 After half-time the Globetrotters would come back with a will and a plan and win the game in the end. They would win even if they were blindfolded. The show had style, funky music, comedy, and was just fun to watch. Here's a video of them coming back after half time. 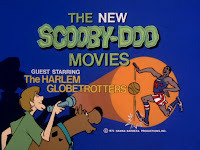 After their 3-season run, the Globetrotters show disappeared but in 1972 & 1973 the characters returned, this time as guest stars, (without granny and their dog), to help out Scooby Doo and the gang in The New Scooby-Doo Movies They did so on three separate occasions. The characters mixed well but this was no real surprise as the shows were similar and both from Hanna Barbara. A few years later, in 1979, the Globetrotters returned with a new line-up but this time they had Super powers. Their powers weren't very original, in fact three of them had the same powers and names of The Impossibles Superhero team except where the Impossibles had Coil Man, the Globetrotters had Spaghetti Man. I guess it didn't matter since both shows were from Hanna Barbara. 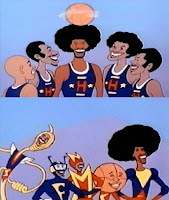 The Super Globetrotters took their mission from flying basketball satellite. Beyond that, the series was similar to the first one. This time they'd play the first half without their powers but after being cheated on they'd come back the second half with their powers and win. This series wasn't nearly as funky as the original and was in fact pretty silly but it was nice to see the guys one last time. The show lasted for only one season, thirteen episodes.